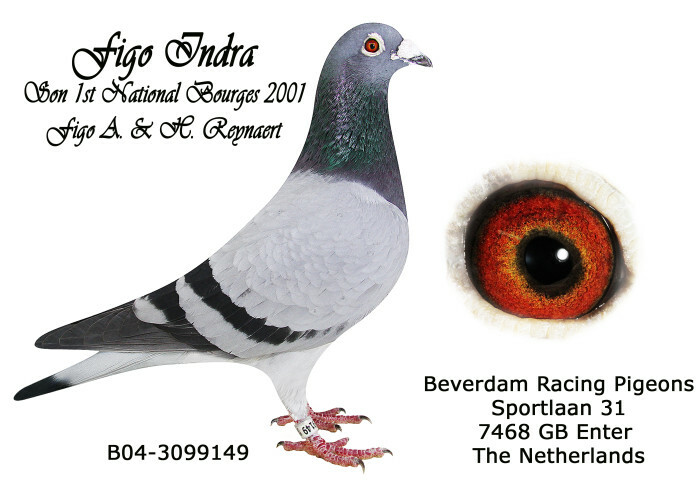 “Figo” bred and raced by Anton & Hilde Reynaert. 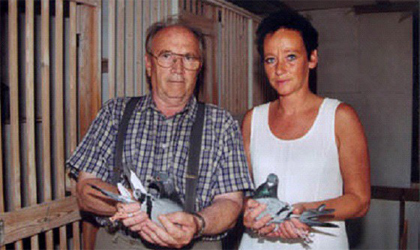 Not only did “Figo” win 1st National Bourges from 12,266 pigeons his blood is responsible for pigeons winning international with up to 99,000 birds competing. The “Figo” a magnificent pigeon. As a yearling he took the 1st prize 3 times from Chartres with 7, 5 and 2 minutes lead. As a two year old the “Figo” raced even more impressively: On the 6th May, he won 1st prize from Clermont, 176km, on the 23rd June the 1st prize from Chartes, 296km with a 4 minute lead. On the 30th June the 1st prize from Tours, 426km against 593 pigeons again with an 8 minute lead. On the 21st July the 1st prize from Blois, 388km. Then came the National from Bourges, 425km he won the 1st prize in the Marking Station with a 15 minute lead. Provincial all West Flanders the 1st prize with a 4 minute lead against 1,213 pigeons, and the National 1st prize against 12,666 pigeons. Altogether he achieved within 2 years nine 1st prizes and often with minutes ahead. Besides these 1st prizes he won many more absolute Top-prizes. Many experts agree that in the year 2001 the “Figo” was the best Middle Distance Pigeon in all Belgium.” “Figo became the no. 1 producer for Antoon and Hilde Reynaert ! The founder of the Reynaert family the “Goen”. At the end of the eighties and the beginning of the nineties the “Goen” (The Good One) was a spectacular Top-Ace. All together he only raced for two years, but in that short time he won ten 1st prizes and five 2nd prizes besides many other top prizes. While the “Goen” was in the race loft he had already bred youngsters, which were top class from the start. 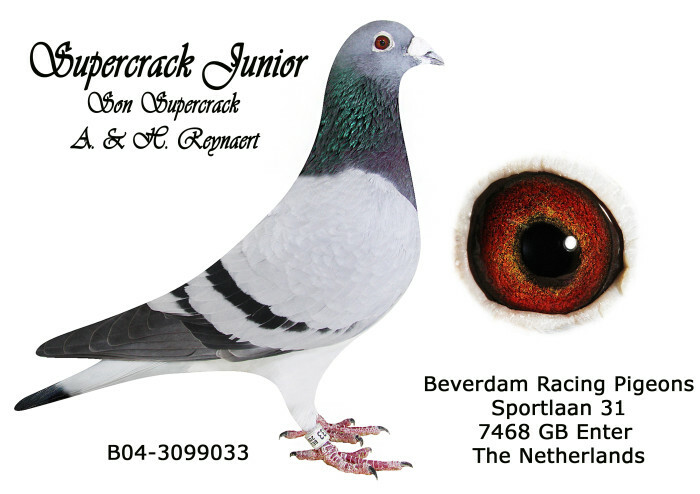 We quickly learned he was not only a superb racing bird but an excellent breeder as well. The best was that his sons and daughters were also good racing pigeons as well as excellent breeding stock. In many other lofts the quality of the “Goens” children were very soon recognised. Direct brother to FIGO, the “De Keizer”. The “De Keizer” won seven 1st prizes as a yearling and up to three years old he won altogether thirteen first prizes without duplication. The mother of the “Figo” and the “De Keizer” is the “Crissie” she’s from the “Hengst” from Robert Venus fourteen times 1st prize-winner paired to the “Sissi” a daughter of the “Goen”. From the FIGO, Goen, Keizer…….in the Beverdam lofts children are producing the superstars of this family. 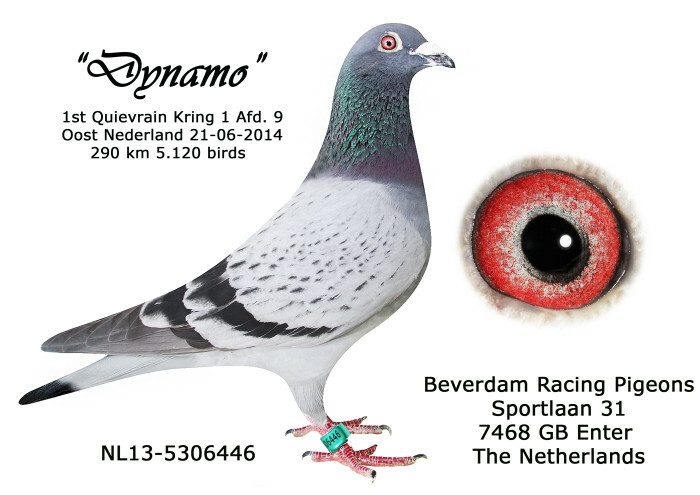 “DYNAMO”, 1st QUIEVRAIN KRING 1. AFD. 9 2014, 5.120 BIRDS!! Read everything about “DYNAMO”, 1st QUIEVRAIN KRING 1. AFD. 9 2014, 5.120 BIRDS! !